Most vapers are former smokers, or current smokers using vaping as a means of quitting. I always suggest that new vapers who want to quit smoking start with a tobacco flavored ejuice, as least for a little while, to give themselves the best chance of sticking with vaping and kicking the smoking habit. Most smokers, cigarette smokers that is, are not exactly tobacco connoisseurs, at least that’s my experience. Pipe smokers, and especially cigar smokers are much more particular about the tobacco they use. The folks at Black Note are themselves connoisseurs, and that’s evident in their line of tobacco flavored ejuices. 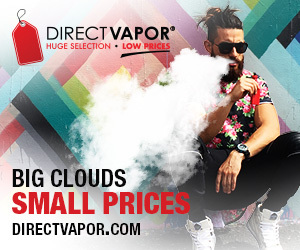 They have six varieties of ejuice, each one a distinct tobacco flavor. From Solo, a minty crisp menthol blend to Quartet, a smokey, peppery Latakia blend. I’m really looking forward to sampling that one. Black Note sent one of their Notebooks, The Ensemble, which includes a 10 ml bottle of each of their flavors. They also sent a 30 ml bottle of Prelude. Prelude is unmistakably a tobacco flavor. But it’s not another run-of-the-mill tobacco ejuice. It opens with a bright note, that’s on the sweet side. The vapor is smooth and the throat hit is solidly in the medium range. The aroma is light with a slightly sweet tobacco scent that is one of the most agreeable I’ve ever experienced from a tobacco ejuice. The longer I vaped Prelude, and I finished that 30 ml bottle, the more enjoyable it became. It was especially enjoyable after a meal or with a cup of hot black coffee, though I quickly began vaping it all day. When I first started vaping I used tobacco flavored ejuices almost exclusively for the first month or so. But it’s been quite some time since a tobacco ejuice has been in my regular rotation of flavors. Prelude may make me rethink that. If you’re a fan of tobacco flavored ejuice, Prelude is one you owe it to yourself to try. It’s a flavor that’s going to grow on you and become a favorite. 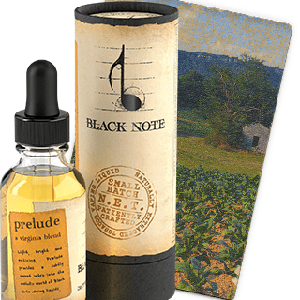 Black Note offers Prelude in 30 ml glass dripper bottles for $29.99. Prelude is also available in 10 ml dripper bottles in their three Notebooks, which also include a number of other flavors. Prelude is mixed with a 50/50 PG/VG ration. Available nicotine levels are 0 MG, 3 MG, 6 MG, 12 MG and 18 MG. I vaped Prelude in the Kangertech Five6 Kit. 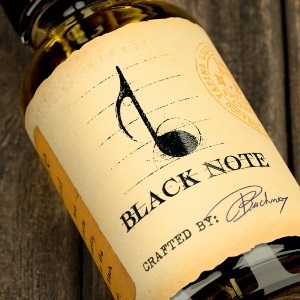 Black Note provided the bottle of Prelude I sampled for the purpose of this review. Order Prelude from Black Note.